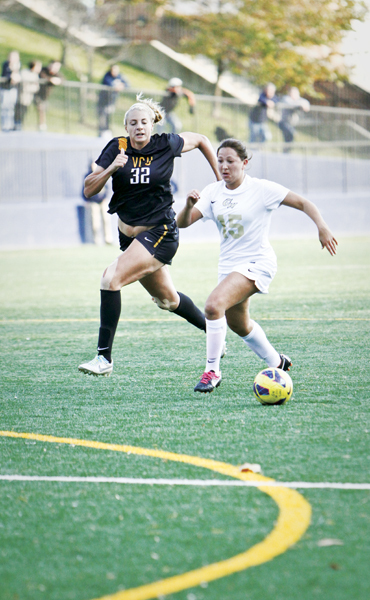 Junior midfielder Nicole Belfonti races down the field last month against VCU. In a matter of 35 seconds, the women’s soccer team’s surprising season was snapped. Despite peaking over the last two weeks, scoring seven goals in just their last two games, the Colonials reverted to their scoreless ways, and fell to the Explorers 2-0 after two second-half goals. After a 0-0 halftime score, La Salle broke through with two goals in the 74th minute, unraveling GW’s chance of a second upset. “Unfortunately we were doing too much chasing. It was sort of like a bad cycle,” head coach Sarah Barnes said. Like their game last month against No. 2-seed La Salle, rainy and overcast conditions set the scene for No. 7-seed GW’s first postseason match since 2002. In the first few minutes of play, the Colonials had an early scoring opportunity, but it would also be their last. Off of a corner kick, junior Nicole Belfonti could not find the back of the net, as the Explorers All-Conference goalkeeper Jessica Wiggins covered up the ball. It was GW’s one and only shot on goal for the entire game. With defenses tightening up on both sides – and playoff nerves getting to both teams – that was also the only shot on goal in the first half. La Salle came out aggressive in the second half, controlling possession and rattling off shots at GW’s defense. Still, though, it seemed like this game might be headed to overtime – a comfortable situation for a Colonials’ team that played five double-overtime games this season, all resulting in ties. That hope unravelled quickly as the Colonials found themselves down one after a goal by La Salle’s Renee Washington. Three La Salle players broke in front of the GW defense, following up the cross and putting the ball up into the goal – all before senior goalkeeper Nicole Ulrick could get into position to react. Then, even quicker, GW went down 2-0, after a shot from 25 yards out by Jackie Cammarata made its way again just past a diving Ulrick. With 15 minutes to play, Barnes then subbed in her goal scorers: senior Jane Wallis, who was the regular season team leader in points, and sophomore Kristi Abbate, second Team All-Conference forward – both of whom were resting on the bench while Barnes worked fresh legs on the field during the stalemate. In the 88th minute, with all hopes of continuing on nearly gone, Wallis created room for herself near the top of the box, but struck her shot wide left. With that shot, it was all but over for the Colonials. “We held the ball for a long time but we let two quick goals that kind of let the wind out of our sails late in the second half and we weren’t able to come back from it,” Ulrick said. The team had reached their main team goal from the beginning of the season – qualifying for A-10 tournament – but could do no more. GW was outshot 16-4, and outmatched by the Explorers in corner kicks, 7-2. The loss marks the end of the careers for Ulrick, Wallis, Claire Haft, Alex Neal and Melanie Keer.